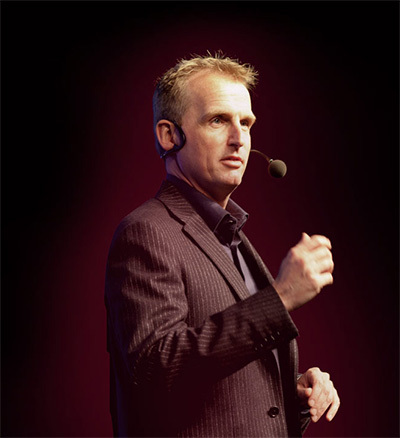 This Performance Coaching guide, together with the GROW Model Guide (best-known performance coaching model), combines the best coaching tips I have collected over the years. Most of the coaching advice you will find in both guides comes from working with Sir John Whitmore, the godfather of performance coaching and author of the bestseller Coaching for Performance (a great book, by the way). Performance coaching is great and I hope these two coaching guides will boost your coaching skills and turn you into a high performance coach! How to become a great performance coach? Here’s a list of with important elements related to coaching. A performance coaching definition, if you like. Do you know at least 6? 1. Performance coaching is a relatively new field. Although Socrates launched some of the basic principles of modern coaching some 2000 years ago, it has only become well-known over the last two decades. 2. In these last 20 years, performance coaching has had a meteoric rise in popularity. Eighty percent of UK organizations are investing in one or more forms of coaching and the International Coaching Federation is attracting record numbers each month. 3. To this day, there is no single agreed upon performance coaching definition. Some are straightforward, others are fancy. 4. My favorite performance coaching definition is by Tim Gallwey, author of several best-selling books on coaching in sport. It goes like this: “Coaching is unlocking a person’s potential to maximize their own performance. It’s helping them to learn rather than teaching them”. 5. Be careful not to mix performance coaching with counselling. Coaching is work-related, proactive and focused on conscious or just below the surface things. Counselling is a whole different ball game. It’s non-work-related, rather reactive and concerned with the core beliefs of an individual. You can do more harm than good by mixing them up. 6. In his article The Very Real Dangers of Executive Coaching (Harvard Business Review), Steve Berglas pinpoints the risks – and unfortunately – the practice of unschooled coaches who enter into more psychotherapy issues with their coachee than they can competently handle. 7. Make sure you do not make the same mistake. If you suspect a work-related issue has deeper origins, call in a professional with the necessary skills. If you are on the receiving end, make sure you have a profile that fits your needs. 8. Performance coaching is all about unlocking future potential performance rather than evaluating and judging current performance. It’s based on the belief that individuals want to and can do a good job. If, deep down, you don’t believe this, coaching is probably not for you. 9. Performance coaching is not so much about passing on individual performance objectives, but rather a technique to take away the barriers that prevent individuals from actually taking on and delivering against their personal goals. 10. Performance coaching is also a way of managing rather than a tool to use in a variety of situations such as planning, delegation or problem solving. It’s a different way of viewing people – a far more optimistic way than most of us are accustomed to – and results in a different way of treating them. 11. There are many performance coaching methods. The good ones will help you as a coach to facilitate learning rather than to direct it. Questioning techniques and active listening are your primary means to do this. 12. Everybody can become a coach. It’s a skill that requires only time and effort to develop. It’s probably harder to give up instructing than it is to learn to coach. 13. Most companies today invest in coaching to improve individual performance. But more and more companies realize there is so much more to gain if they can harvest the individual benefits to improve the overall company performance. 14. There is no single ideal way of measuring the coaching ROI for companies – although many claim to have the best. Our minds can only process a limited amount of information at the same time. We have a mechanism in our brain that filters all incoming signals and only those considered important come through. It would be impossible to function without it. This selection process takes place automatically without any conscious effort. You don’t have to do anything. You can however feed your brain better input and influence the importance given to certain inputs. By being aware – or in other words by tuning your senses and engaging your brain – you are in control of the quality of input that your brain receives and the importance it is given. So how does awareness relate to coaching performance? Performance coaching aims to increase performance – the output. The output increases when there’s better input. And you improve input through awareness. So if you can help your coachee to increase awareness and thereby collect help to collect better input, you dramatically increase the possibility of increased output. As a coach, you cannot tell someone to become aware. It’s up to the coachee to direct and engage his brain through focus. By asking the right questions however, you can facilitate this process. So to increase your coaching performance, you need to always check the change in awareness level first. If nothings happens at that level, you need more effort before moving on. This is a short, but very important paragraph for those looking to position performance coaching into a company context. Strategy execution is made up of many, MANY individual execution efforts – an infinite to-do list taken up by different people at different times. Performance coaching helps this process by creating the necessary commitment with the individuals involved to move these actions forwards. In other words, performance coaching creates engagement to get things done. This is different from counseling or mentoring. Want to improve strategy execution? Boost the coaching skills of your managers. Last but not least, a list of 30 practical performance coaching tips I developed together with Sir John Whitmore. They are listed in my book Strategy Execution Heroes. Please be aware, there is no one way of coaching all individuals in all situations. The list below is therefore incomplete and even has some contradictory performance coaching tips. But they have all been tested and will be useful for you as a coach somewhere along your growth path. As your coaching skills develop, so will your needs for further development. It might therefore be a good idea to run through this list every few months. You will see that, after some time, certain coaching tips will hold no mystery for a high performance coach anymore and others will attract your attention and reveal different nuances over time. Download a free checklist Get a useful PDF checklist that helps you to identify the best tips for you! Ready to boost your coaching skills? Asking closed questions prevents people from thinking. Asking open questions causes them to think for themselves. No inspiration? Here’s a long list with questions following the performance coaching process steps from the GROW model. Ask open questions that demand your coachee to focus more than usual to give accurate answers. Here’s an example: ‘Can you summarize in three headlines the added value of awareness and responsibility for your coaching activities in the future?’ rather than ‘What do you remember from the previous coaching experiences?’. Ask open questions that demand descriptive, non-judgmental answers. This way, you avoid causing self-criticism or damaging your coachee’s self-esteem. Asking why often implies criticism and triggers the coachee’s analytical thinking process. And analysis (thinking) and awareness (observing) are two different mental processes that are virtually impossible to combine to full effect. So aim for questions that start with words such as what, when, who, how much and how many. Make your coaching questions clear and unambiguous. It helps when you limit yourself to one brief question. And listen for the response before launching a new question. A useful metaphor for the performance coaching model ‘GROW‘ is the plan you might make for an important journey. First, you start with a map that helps your coachee decide where they are going (their Goal) and establish where they currently are (their current Reality). Then you explore various ways (the Options) of making the journey. In the final step, establishing the Will, you ensure your coachee is committed to making the journey. You don’t need a formal coaching session to raise someone’s awareness and responsibility. In fact, most coaching takes place unsolicited, with the coachee unaware of the process. The coached individual will simply think that you were being particularly helpful and considerate. This means that every conversation you have becomes a potential testing ground – a learning experience – to improve your coaching skills. Everybody learns, even the best coaches. So do ask for feedback from your coachee. Besides the positive learning experience for you, it has the extra benefit for improving the relationship. You increase the chances that your coachee will be more open to feedback when s/he is next on the receiving end as feedback is becoming part of the way you interact. I have mentioned before how important it is to begin the coaching process, formal or informal, with a clear definition of what your coachee would like to achieve. Using a self-evaluation form helps this process tremendously. There are many lists on the internet, or if you can’t find one that suits your needs, build one. 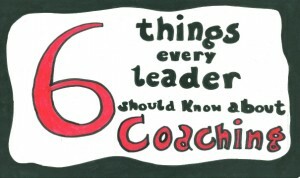 With as few as 10 questions you can offer your coachee your first added value. When coaching for performance, you aim to improve certain performance shortcomings of your coachee. But remember, it’s not all bad all of the time. I’m sure you can find several good, even great, behaviors that your coachee possesses. But without the proper attention, she might not be aware of them, or even worse, adds them to the list of behaviors that need to change. Make sure you identify those positive behaviors and help your coachee leverage them. It’s a great way to stress the positive and help your coachee reach goals faster by building on existing strengths at the same time. When you know the coachee, you probably have more information available. You might, for example, have heard something from a colleague. And I know it’s tempting to use that information, but be aware that using it will often have a negative impact on your coaching relationship – whether the information is correct or not. So stick to what you hear directly from your coachee. Ask your coachee open questions that will make him reflect. You should be able to detect it from their body language such as a pause before answering or a raising of the eyes. When you ask questions solely from the normal, conscious level of awareness, you may be helping your coachee to structure his thoughts but you are not probing for deeper levels of awareness. But when your coachee has to really dig deep to find the answer, new awareness is created. And once found, the input becomes conscious and readily available for the coachee to use. Whether or not to opt for a coaching approach depends on your situation at a given moment. If timing is the most important criterion in a specific situation, such as in a crisis, doing the job yourself or telling someone exactly what to do is probably your best option. If quality matters most, you will get the best results with coaching for high awareness and responsibility. If learning and retention are crucial, coaching is again your best choice. Don’t confuse or fool yourself by pretending to coach when you are actually doing something different. If you want to teach, then go and teach. If you want to sell, then do so. But don’t use coaching as a means to something other than for what it is intended. It might give you the desired outcome in the short-term but will always backfire and create more problems at a later stage. There is no need to complete a psychology degree before you can start coaching. But as coaching is all about human interaction, it’s useful to have a basic understanding of what drives human behavior. If you get a better understanding of people dynamics, your coaching skills will improve. It gives your coachee more time to collect high-quality input and creates responsibility. And it will give you more coaching time and a solid starting base for your next session. Evaluate carefully the amount of time you allocate to coaching. In some situations you can delegate particular coaching jobs to others. When delegating a coaching job to someone else, you are stimulating that individual to apply and build their own coaching skills. It further enriches your own coaching practice as you are approaching coaching from a new perspective. Even after years of performance coaching, I still find it refreshing and rewarding to coach coaches. Just because you read somewhere that a coach should not delve into the content, doesn’t mean that you can’t provide some input. You just need to be careful with your timing and delivery method. A good time to offer your knowledge or experience is when you recognize that the coachee has exhausted all possibilities during the Option phase – the ‘O’ from GROW. Ask the following question: ‘I have some more options and ideas. Maybe you would like to hear them?’ You can style the question to your liking, but do make sure that it’s clear to your coachee that you are momentarily stepping out of your facilitating role. When providing your input, make it as short as possible. Try to put it all into one phrase. You don’t want to be talking for the next 10 minutes. If you have more then one session and know the topic, you can write your tips on paper and get a feeling for the tone and directness of the message. Remember to make it clear to your coachee that your input should be treated in the same way as his own options and ideas. A no-nonsense approach will help your build a relationship of trust. It is extremely damaging to that relationship to go back on something that you supported during a previous session. If you don’t have the answer, say so and offer to find it by the next session or possibly earlier. You may find it easier to coach two people at the same time. It might sound strange as, like most people, you probably have the image of performance coaching as a strictly one-to-one process. But it’s rewarding to look beyond that preconception. I found that coaching two people at the same time can reduce tension and provide a great opportunity for role-playing. You should use, and encourage your coachee to use descriptive, rather than evaluative words. The more specific and descriptive words and phrases become, the less criticism they tend to carry, and the more productive the coaching will be. 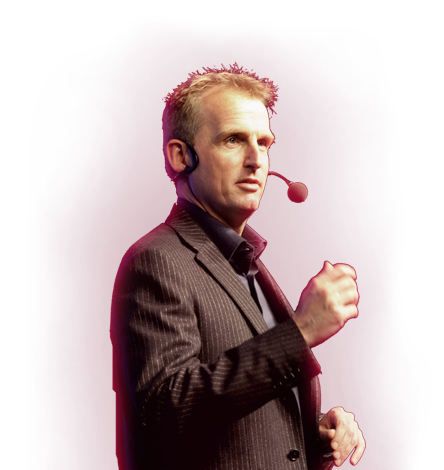 So don’t just tell a speaker his presentation was poor or inadequate – this will only make him feel bad. He wants to know that the presentation was clearly structured, brief but rather monotonous and pitched at too low a level for the audience. Remember that description adds value, criticism detracts. You probably won’t get very far by telling your boss what to do. But applying some of the coaching principles and coaching upwards can increase your success rate dramatically. There are many performance coaching methods. GROW, the best known performance coaching model helps you structure your coaching conversation. It gives a proven, logical sequence to your questions. But even though there is a sequence, you need to go back and forth between the different steps. You might start with a vague Goal that only becomes clear after examining the Reality in some detail. It will then be necessary to go back and define the Goal more precisely before moving to the Options. Even a clearly defined Goal might prove itself wrong or inappropriate once the Reality is clear. Similarly, when listing the Options, it’s important to check back if they help to move towards the desired Goal or not. And finally, before the Will is finalized, it’s crucial to see if the action plan, once realized, achieves the Goal. Too much preparation destroys your flexibility. Develop a general road map for your next session rather than a detailed, step-by-step instruction manual. These are crucial. Coaching is all about human interaction. Make sure you master a basic communication model. It’s better to have a thorough understanding of one model that you can actually apply in practice rather than have only a theoretical background on a few of them. If your coachee is motivated for the next session, it’s often a first sign that something positive has been put in motion. Often your coachee will say something like ‘When I started the presentation I gave a short introduction. Then it all blocked’. Instead of talking about something, I often find it useful to ask the coachee to replay a certain situation. It makes it more concrete and offers a great opportunity to test out some of the Options. When your coachee is able to do a successful role play exercise, the motivation, self-belief and learning curve receive a huge boost. Here’s a simple but effective feedback method you can use all the time. It’s called LCS – which stands for Like, Concern, Suggestion. Start by saying something you liked, then add your concern and end with one or more suggestions. Here’s an example: ‘I’m happy you have almost finished reading all these tips. But by only reading them, I’m concerned it will not boost your performance coaching skills as it is more important to actually put them into practice. So I would suggest picking your three favorite ones and thinking about how best you could use them in the assignment I gave you earlier’. 30. Everything your coachee says is important. It’s your job to find out how it is important. Check out the GROW coaching model guide if you like to learn more about performance coaching. 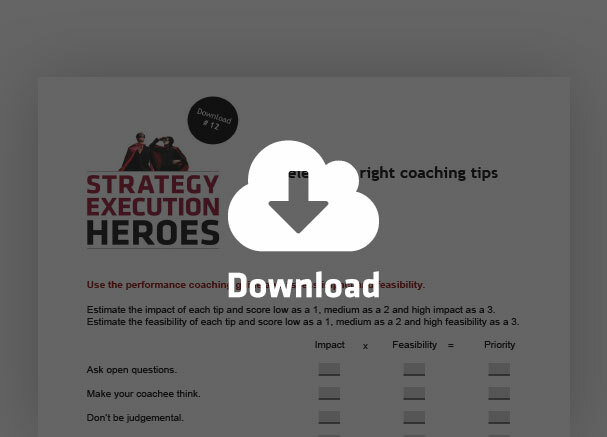 Want to learn more about performance coaching and the link with strategy execution? Check out the ultimate strategy execution guide. Want to be inspired about coaching? And now it is your turn to put these performance coaching tips in practice! To help you, John Whitmore and I developed an easy-to-use checklist to track your progress. We believe it’s a good idea to run through this checklist every few months. Previous Post Megatrends 2030 I 6 Global Megatrends that Matter in Business Strategy! Next Post 60 Amazing Time Management Quotes with References!